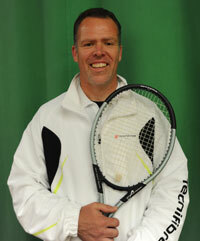 Luvtennis provids the coaching at Hazlemere Tennis Club ,High Wycombe Lawn Tennis Club and Horsenden Tennis Club. It is headed up by Guy Britton (right) who has worked for over 30 years in the leisure industry. He has worked at Bisham Abbey National Sports Centre, Beaconsfield School of Lawn Tennis, Parkwood Leisure and LA Fitness as well as being the co founder of Gymfit4less. Luvtennis is the tennis brand that delivers a full programme of mini/junior coaching, adult coaching, one to one sessions and with a good competitive environment. We can provide coaches for kids parties. We cater for all ages and abilities.